Celiac disease can cause bacterial overgrowth in the small intestine. This is bacteria that is normal in the colon where it belongs, but which migrates to the small intestine. Normally, the small intestine is free of bacteria due to a variety of mechanisms that keep it clean. Celiac disease can disrupt these mechanisms, causing bacterial overgrowth. Note that most of these symptoms are the same as for celiac disease. 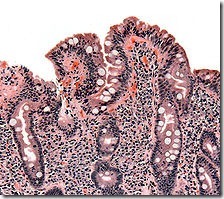 Bacterial overgrowth can also cause a flatting of villi in the small intestine, similar to celiac disease. This can lead to continuing celiac-disease-like symptoms if going on a gluten-free diet does clear up the celiac disease, but does not clear up the bacterial overgrowth. Other factors besides celiac disease, listed below, contribute to bacterial overgrowth. Bacterial overgrowth is caused by changes in the body that effect normal mechanisms that keep the small intestine clean. Normally, the small intestine is flushed with acids, enzymes and antibodies. 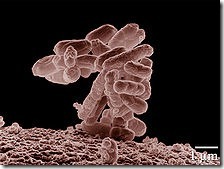 If any of these is disrupted, bacterial may have a chance to take hold in the small intestine. Antacids or medication to reduce acidity in the stomach can cause disruption to the normal methods used to keep the intestine clean. It is common for celiacs to take antacids. Bacterial overgrowth is usually treated with antibiotics. While effective, this is problematic because antibiotics also affect healthy bacteria in other parts of the gut, and can lead to other problems. Going on a gluten free diet to manage the celiac disease, along with reducing or eliminating antacids (if no longer needed by the change of diet) may resolve the problem. If not, or if the problem can’t wait, antibiotics may be necessary. Previous post: Mold in the House – Can it Cause Illness?